Over on Star Maker Machine, We have just completed a week of songs of peace and fellowship. I originally thought of posted “Down By the Riverside” there, but, as I thought of what I wanted to say, I decided the post belonged here instead. 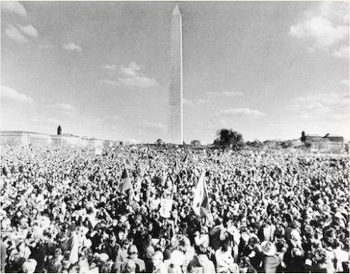 I went to my first peace demonstration as an eight year old, in 1968. My father took my two older brothers and me to protest the Vietnam War. No doubt, I first heard folk music and spirituals at these demonstrations, but that is not how I remember things. For an eight year old, the most memorable thing was just the hugeness of it all. I boarded the bus in a town of 800 people, and disembarked into a sea of one million. My senses were overwhelmed. We formed this giant organism that slithered down the streets of New York or Washington to some common space that was never quite large enough to hold all of us. We sang together and chanted together as we marched, and cheered speakers and musicians together at the rallies. While we were together, a million strong, we could not imagine how anything or anyone could deny our will. It was always amazing to me to see the news coverage, and the pictures in the paper the next day. There would be overhead shots meant to emphasize the size of the crowd. I knew that viewing these images with a microscope, it would be possible to find me. I was aware of the music as it played and the speakers as they spoke. We were raised in my family to place great importance in such things. But, as we headed home, the details would begin to blur in my mind. The information would stay lodged in my brain, and as I encountered some of the music again later in life, I would have the sense of meeting an old friend. But the next day I could not have told you who we had heard. I am sure that I first heard “Down By the Riverside” at one of these demonstrations. It could have been Pete Seeger or Sonny Terry and Brownie McGhee performing it. Or, it could have been someone else. I certainly don’t hate the internet. I wouldn’t be here if I did. But, in the progress that the internet represents, something was lost. 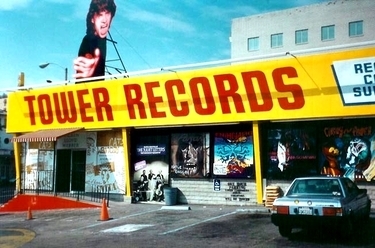 Tower records was a Mecca of music, popular and obscure. But for me the fun of a trip to Tower was finding obscure music magazines. I know that you can find any magazine you can imagine on line, but you can’t form the same kind of impression that you when you hold it in your hand and flip through the pages. Sometimes, even the quality of the paper would influence my decision On what would prove to be my last visit to Tower, I found Pop Culture Press and Texas Music magazine. Pop Culture Press had a sampler CD, and I had to have it for that reason, as well as for the articles. Of course, magazine sampler CDs are a crapshoot, especially if you are buying the magazine itself on spec. But I did make one discovery. Her name is Cindy Woolf, and the short description of her style, accoustic country, doesn't do her justice. The band includes drums, stand-up bass, accoustic guitar and fiddle. She has one of those sweet Texas voices somewhere between Nanci Griffith and Iris Dement. I like the fact that the bass is featured in the mix, so that you know its a stand-up and not an electric. The sampler has a tune called "In the Attic," and I also found an MP3 of "All About You" on her label's website. I knew in advance that we would be doing a holiday theme this past week at Star Maker Machine, so I began to think about what I might want to post. When the theme turned out to be Jingle Bells, I had to drop any plans for Channukah songs. I don’t know of any that have bells, and I suspect that there aren’t any. Consider. Christianity in Europe became the dominant religion in a given area before the Christians built their churches. A regular feature of these churches was the church bell, used to let everybody in town know that services were starting. The Jews, on the other hand, were never the dominant religion anywhere, until the founding of Israel in 1948. 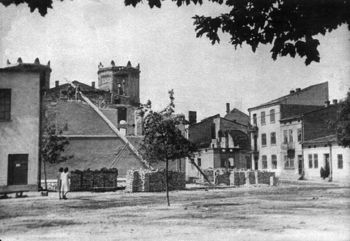 Yes, the synagogue, such as the one shown above, was the center of town, and the most prominent building in town. But the Jews often had to flee for their lives. They had no interest in calling attention to themselves. Word of services was spread more quietly. Taking this a step further, Judaism is a birthright. Many Jews believe that you cannot convert to Judaism: you must be born to it. But trace the ancestry of any Christian far enough back, and you will find that someone converted. And that is why Christianity has an emphasis on spreading the word, and testifying. And the symbolism of the bell, particularly as it pertains to Christmas, is all about this. Channukah, on the other hand, is a minor holiday to begin with. It only enjoys its prominence within the United States to compete with Christmas. I grew up in a Jewish household, and our next-door neighbors were Christians who bestowed lavish gifts upon their children. So this makes perfect sense to the adult me. So that is why I would be surprised to find a song with Channukah bells. And you will find below two of the songs I was thinking of posting before the theme was announced this week.